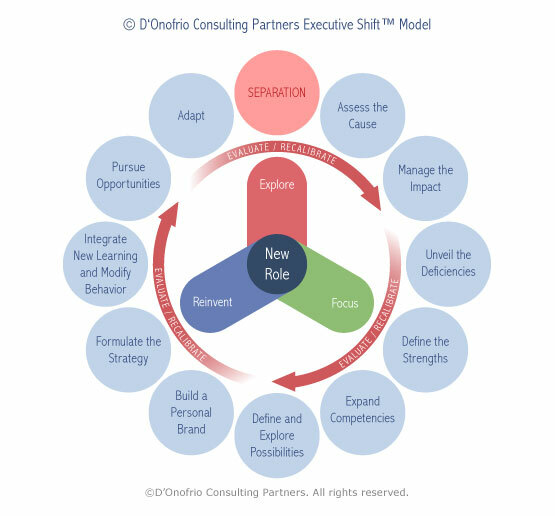 The D’Onofrio Consulting Partners Executive Shift™ process equips executives in the midst of transition with a blended approach of executive coaching and executive career management services that helps them navigate effectively and smoothly through transition. Unanticipated furlough can create roadblocks that hamper an executive’s focus in securing a new role. We help executives mitigate stress and embrace the opportunity to land an equal or expanded role in an organization where the individual can advance career objectives. The global business landscape is one of continual change. In order to maintain competitive advantage, our goals, habits and strategies must keep pace. D’Onofrio Consulting Partners’ expertise in leadership development, career management, and executive coaching provides you an effective set of tools that enable new frames of reference and ensure your goals are met. To achieve our shared objective, we focus on creating forward momentum that takes advantages of insights gleaned from previous roles and life experience. We create a safe and challenging environment where the individual can shed self-limiting beliefs and focus on whatever results are desired. You can expect a combined approach of assessment, exploration, and evaluation. The executive and his/her coach will develop a plan that translates ideas and insights into action, incorporating the critical aspects of the analysis into a pragmatic career strategy. Once an action plan has been implemented, the executive and coach meet regularly to evaluate progress toward goals and re calibrate strategies that can be enhanced.